Revolt Bar and Kitchen is a hip bar with arresting interiors and affordable tasty food. Yes, the kind you would want to go to with friends on a Friday night. At the entrance, there is wall art of Captain Jack Sparrow, and that of a hand breaking out of a wall (yay says the Instagrammer in us). Walking in you will find assorted wooden tables and chairs occupying the spacious floor. 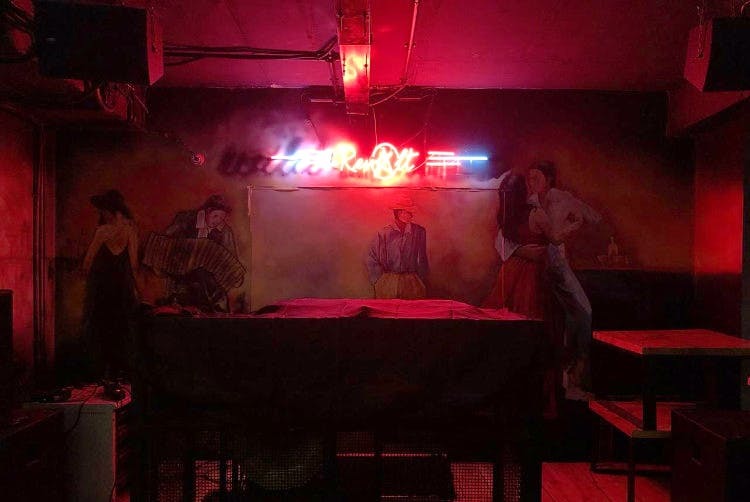 The ambience is a good kind of sombre with legends like Michael Jackson and Charlie Chaplin adorning the walls and doodles of cityscapes, silhouettes of people dancing, and neon lights too. The bar is to a far corner and there is a stage set up too where stand up comedy and DJs can take over. The music was a little too loud, but when the food arrived — we didn’t mind the music all that much. Their menu is an amalgamation of Chinese, North Indian, Continental and finger food. Being the paneer loving folks that we are, we ordered Paneer Tikka for a starter, and picked Butter Naan with Paneer Butter Masala for the main course. Among the Chinese dishes, we got Stir Fried Vegetables. The Paneer Tikka just the right amount of spicy and soft, whereas the Paneer Butter Masala was slightly sweet but we think that’s what set it apart. Served with rice, the Stir Fried Vegetables were well seasoned. Their menu is vast, so you have a lot of options from kebabs to biryani and Thai curries. All of this is at really affordable prices (everything on the food menu is under INR 400) as the restaurant aims to bring back the basics of making delicious food available without digging a hole in your pocket. They also have happy hours between 12pm-11pm (Sunday to Thursday) and 12pm-8pm (Friday and Saturday) during which drinks from Budweiser to Bacardi are available for a mere INR 129; they also have cocktails (INR 169) and mock tails (not a part of the happy hour, though) if you’re in a mood for that. Be it for an evening with your squad before payday, or just to have some drinkies on a weekday afternoon —Revolt Bar and Kitchen is your go-to place. Keep your eye out for the comedy events here that have previously hosted the likes of Kenny Sebastian and Abish Mathew.